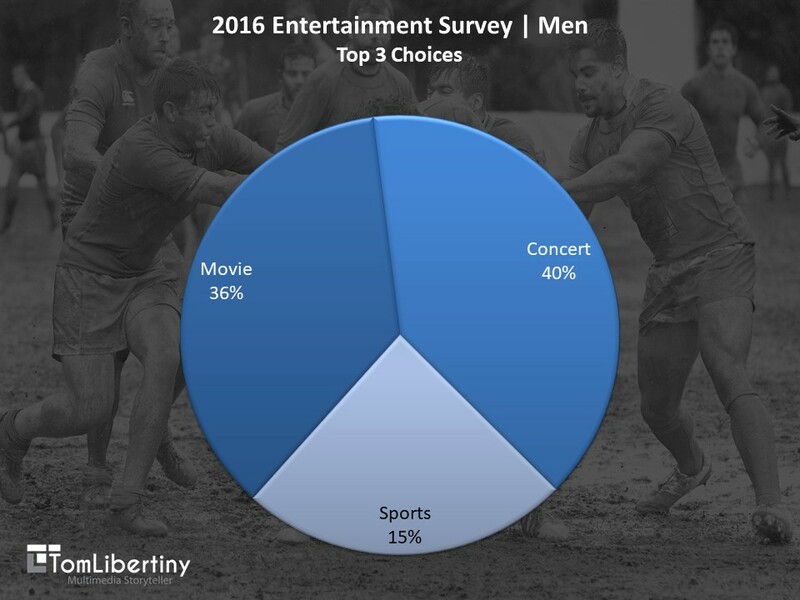 Results of my 2016 entertainment survey for men. Here’s some of my survey results and observations. Regardless of age, men either attended concerts once per month or once per year. Pricing, while a major consideration, was less of an issue than for women. Further, men are willing to pay significantly more than women for an event, frequently citing $40 to $50 per ticket as reasonable with a statistically significant portion willing to pay more than $50 per ticket. 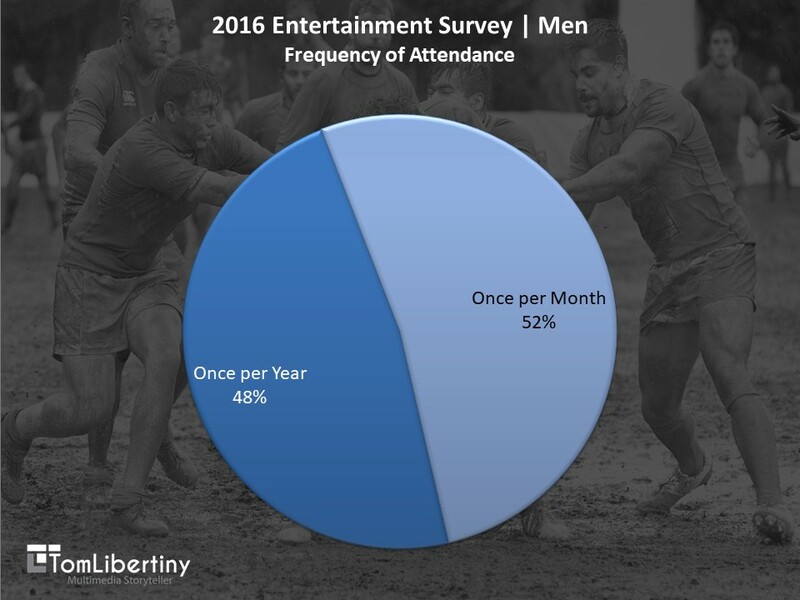 This wasn’t surprising since men clearly don’t attend as many events as women (Reference | Charts 1, 2, and 3). The pricing results was also inline with the results from the subset of women who don’t attend events frequently. If your audience demographic is primarily male, then to be successful, you’ll need to produce unique events that convince men to make your event a destination during their monthly or annual spend and find a different audience of men for each of your events if you’re producing them more than monthly. As in my survey analysis for women: can you find content providers and create a business model that enables you to provide different content on a weekly basis attended by a different weekly audience? The benefit of this model: A much more diversified and larger overall audience that is more recession proof. This model also leads to much greater word-of-mouth advertising for your content and venue: the most effective form of advertising. And, it may lead to potentially higher profit margins depending on the content you choose to provide. 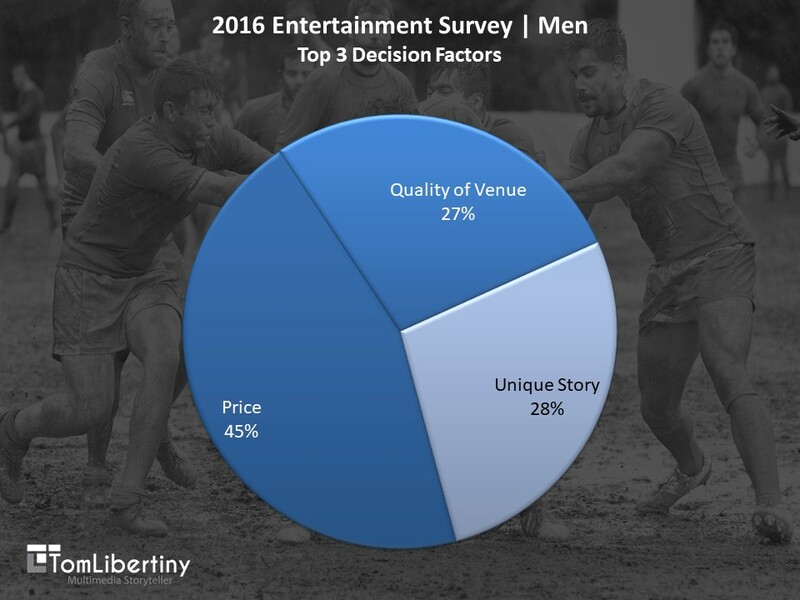 Nearly identical to women: while pricing was important for a frequent entertainment patron, a high quality venue (Examples: Good quality service, cleanliness, safe, easy-to-find, and available parking) and unique stories came in 2nd and 3rd place (Reference | Chart 2). As an entertainment venue owner, does your venue measure up? As an artist, does your content measure up?